Carl Barks Finally Done Right? Since I’ve been fairly engaged in the sad fortune of the Disney comics of Carl Barks (1901-2000) in reprint, I figured I would comment briefly on the recent announcement by Fantagraphics that they will be helming a complete edition, starting this fall. Already publishing the reprint editions of The Complete Peanuts, Krazy & Ignatz, Popeye, and Prince Valiant (and, soon, Walt Kelly’s Pogo and Floyd Gottfredson’s Mickey Mouse) — all exemplary presentations of classic comic strip material — one could not wish for a better publisher to undertake this project. This is really good news. All earlier editions of the Barks material have been faulty. The best is clearly Another Rainbow’s luxuriously packaged, slipcased hardcover set Carl Barks Library, published in the 1980s. But it presented the strips in black and white — great for connoisseurs, but ultimately uncongenial to material intended for colour — and published several of the less politically correct stories in redrawn, censored form. 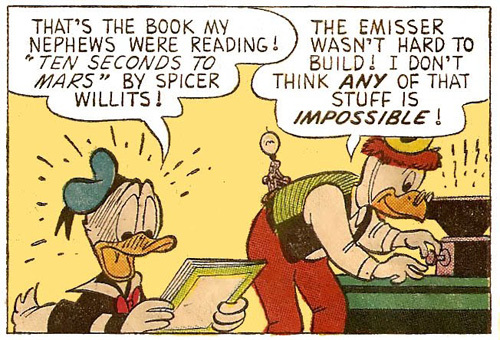 It was followed in the 1990s by Gladstone’s cheaper series of albums, The Carl Barks Library in Colour, which printed the previously censored strips in their original form, but was marred by insensitive, if not downright counterproductive, computer colouring. Moreover, this edition was the least complete of the collected editions so far, leaving out the late Grandma and Daisy Duck material drawn, but not written, by Barks, as well as the Junior Woodchucks stories that Daan Jippes completed over his layouts in the 1970s. For a long time, Disney comics have mostly been produced in Europe, primarily Scandinavia, and the Barks stories have been reprinted there many times. The only complete edition, however, was published by Nordic publishing giant Egmont between 2005-2008. The most complete to date (leaving out only his very last story “Somewhere in Nowhere”, drawn by other hands and published in 1997), it was the first to present the stories in strict chronological order. It is entirely uncensored and includes several novelties, not the least a new version of “King Scrooge the First” (1967), redrawn by Jippes, replacing the earlier, inferior one by Tony Strobl. It was however coloured in the same garish fashion as the Gladstone series (see examples here). Egmont’s edition was to form the basis of the complete edition in the original language announced in 2008 by the now-defunct Gemstone. Given their record of handling the material, as well as other reprint series (the newly-coloured EC Library, anyone? ), it is a relief that the baton has now been passed to Fantagraphics. Presumably, Egmont’s material will still form the basis of the Fantagraphics edition, but according to publisher Gary Groth, it will be handled entirely differently. Most significantly — thankfully — it will be recoloured in its entirety in flat colours, to match as closely as possible the colouring of the original comics. Similarly, it’ll be printed on non-coated stock and, for the first time in a complete edition, it will be close in size to the original comic book format, rather than enlarged. Somewhat puzzlingly, Groth states that the comics won’t be reproduced at full size, but rather at about 95% of the original comic book pages. I assume this is for technical reasons, having to do with printing costs, and it surely won’t be a huge problem. Last but not least, the volumes will be affordable, distributed to bookstores (and apparently also to Disney stores), and thus will be more likely to get into the hands of the all-ages readership for which Barks intended them than any of the previous, largely fan-oriented versions. In what is another novelty, interesting especially to collectors I suppose, the volumes will include supplementary material handled by the estimable Donald Ault — consistently the best Barks scholar/critic of the past forty years. Hopefully, they will also include much of his writing, which was toned down considerably in the selections made for the earlier editions — in part, I’m told, because of its academic approach, which shouldn’t be a problem: Ault can be dense reading, especially when in Lacanian mode, but he is generally a lucid and always provocative, thoughtful writer (much more interesting than the capable and well-informed, but somewhat pedestrian, Geoffrey Blum, who wrote most of the material for the Gladstone and Egmont editions). So yes, this is really great news. My only reservation at the moment are with Fantagraphics designer Jacob Covey, whose work I find somewhat erratic, ranging from the elegant, but somewhat dry (e.g. Beasts) to the gimmicky and cluttered (e.g. Popeye). Also, from what I’ve seen of his work, I’m unsure about Rich Tommaso’s abilities as a colourist, but that’s probably just me be overanxious. My only lament is that it’s going to take 15 years before the 30 or so volumes of the series will be available, but looking on the bright side, it’ll mean a steady stream of Barks to be discovered, read and talked about (instead of bought and filed away) by audiences both old and new for a decade and a half. That ain’t half bad! Images from Walt Disney’s Comics & Stories #249 (1961) and 199 (1957). Har siddet helt alene med Egmonts samlede værker af Carl Barks, og været fortvivlet over det pavre resultat. 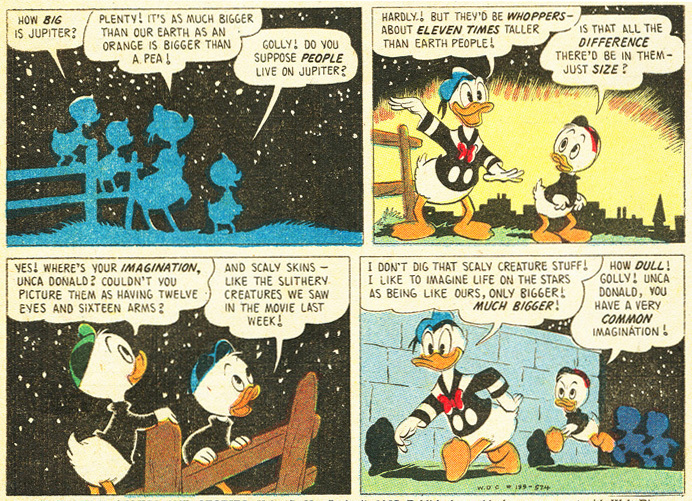 Carl Barks Anders And har været noget nært det bedste jeg nogensinde har læst, og nu hvor jeg har råd til at investere og bruge tid på kvalitet, har det ærgret mig at der ikke var udsigt til at få “samlet” alle de løse tråde af det bedste i min litterære barndom. Eller rettere sagt, få den samme gode oplevelse en sidste gang. Det ser ud til at Fantagraphics nu vil samle faklen op, og forhåbentligt bringe den hjem. Tak til dig Matthias Wivel for dine kritiske, og ærlige, artikler om tidligere og bestående samleværker af Barks. Jeg vidste ikke at der fandtes folk som dig, der gik i rette med dem, der ikke forstår hvad det er Carl Barks har efterladt i denne verden, jeg tror og håber på at det er grunden til at vi nu om små femten år kan få et sidste møde med vore bedste litterære minder. Hvorfor har du ikke en fast tegneserieklumme i Weekendavisen ? De kunne virkeligt godt bruge det. Ja, hvorfor har du ikke en fast klumme i weekendavisen? De har tonet ned for tegneserieambitionerne på WA. Jeg tror ikke de er interesserede. Jeg ville nok heller ikke helt orke det, hvis det var. Så hellere skrive til dem en gang i mellem, når der virkelig er noget jeg gerne vil skrive om. Men tak, Thomas L., for de fine ord og tanker! Could you please tell me the title of the story that second scan is taken from? I remember reading it a long time ago, but I can’t find it now! It’s from Barks’ great virtual reality story — you can read it in its entirety here. I’ve added the source info for both images at the bottom of the post. Hvorfor har du ikke en fast klumme i Politiken? Ja, hvorfor har du ikke en fast klumme i Politiken? Hæhæ, se mit svar ovenfor. Hey Domingos, thanks for that awesome link! As I understand it, the dots are still there in conventionally printed comics, they’re just smaller, the separations finer. But preserving this aspect of old comics, which holds undeniable aesthetic appeal, will be a consideration in future restorations. I kind of hope it will, because — as they say in that article — many of the new reprints don’t do justice to the fragmented depth of the original colouring. Next up would be preserving separation mismatches (as seen especially in the first WDC&S example above), but might that be going too far?